Tesla is quite probably the most well known manufacturer of electric vehicles in the world and for good reason, it has produced a brilliant car. The Tesla Roadster has chassis borrowed directly from the Lotus Elise which has a place on every intelligently thought out top 10 list of best sports cars in history. They chose the Lotus chassis for its racing pedigree but also for its ultra light weight, Tesla has added a much more luxurious interior, added a 288 HP (215 kW) electric motor that peaks at 14,000 rpm as well as a computer controlled battery array that can take you 244 miles (393 kilometers) before requiring more juice. 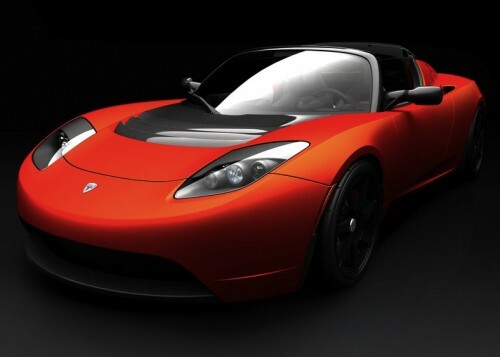 Tesla recently built their 1,000th Roadster and were recently issued a government loan of $465 million USD to build their new “S” model four door sports sedan due out in 2012. At $101,500 USD the Roadster is not yet a car for the masses, although if you calculate how much you spend on gasoline each year you’d probably be able to justify it, as always with these things, as the technology becomes more commonplace the pricing will begin to drop to a level where you will see them being driven by school teachers and middle management types instead of movie stars and web 2.0 billionaires. Expected Battery Life – Seven years or 100,000 miles. Battery – Custom microprocessor-controlled lithium-ion battery with 6,831 individual cells. Full Charge – About 3.5 hours using the Tesla Motors Home Connector at 240 Volts and 70 amps. I love the Lotus but I can’t help but feel that the Tesla designers screwed up the front end, the Elise just looks so much better! Agreed on the front end design, actually looks a lot like the new Lotus Evora. Really a lot.